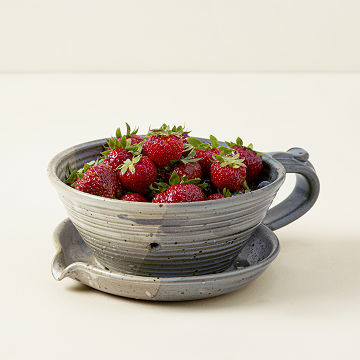 Give farm fresh berries a rinse with this beautiful stoneware strainer, handcrafted by Brian Kunkelman. Give farm fresh berries a rinse with this beautiful stoneware strainer, known as the Berry Buddy® handcrafted by Brian Kunkelman. An all-in-one design, this prep essential offers a built-in drip catcher and spout for easy clean up. The organic finish and homespun silhouette make this a timeless addition to your kitchen. Handmade in Pennsylvania. “There’s a fine line between a rut and a groove,” potter Brian Kunkelman likes to say. This sentiment underscores the delicate balance required to hand-throw his designs with the right mix of consistency and hand-crafted variation that makes each piece one-of-a-kind. Brian is a potter who seems to go with the flow, a metaphor that runs through his studio and craft—from the water that flows through the cultivated pond outside his studio window, to the variety of music that flows through his speakers (equidistant from his potter’s wheel), and the meditative motion of working with stoneware clay. Using little more than his hands and his trusty, powered foot wheel, he deftly coaxes clay into clever bowls that meld organic elegance with utility. Read a Q&A with Brian on our blog. I definitely would buy again. Use the product almost daily. Handles well and looks nice. Love this Beautiful Piece of Pottery! This piece is beautiful and so functional - what a great idea! It is used daily in our household and I can't imagine not having it....it's a kitchen-must!!! It will be used to rinse fruit. They both love the gift. Practical and beautiful. Finally - a perfect fruit bowl! We always have fresh fruit available in our refrigerator and I have been looking for a slotted bowl that was large enough. This one is perfect and pretty! Love rinsing my berries and draining them right away. Best little berry washer ever. It's so well made and looks great left out on the counter. I have been searching for the perfect berry bowl for years. The pottery place that we used to shop at was sold and since not only moved, they changed their entire format. I have been scouring the farmers' markets but everything I've seen has been way to small to hold a normal amount of grapes or cherries. I took a chance buying this one online and it ended up perfect. My mom loves pottery, all of her dishes are mix-matched pieces of hand crafted pottery. She also loves in Florida and has fruit everyday! Useful and stylish!